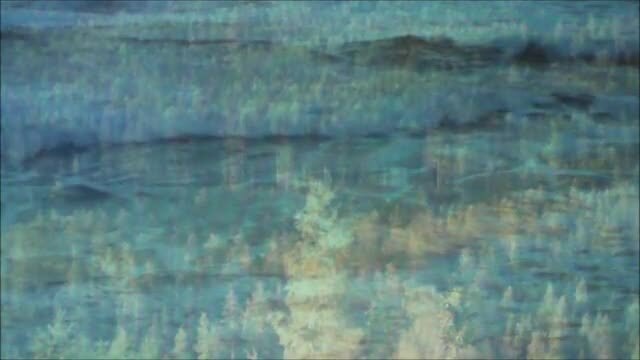 “The Landscape in Us” (Anitta Toivio and Dotti Cichon 2011) is a large-scale video installation where a video of the Pacific Ocean is projected onto organza in front of a backlit photo of the forest in Finland. It is projected so the shadows of visitors become an integral part of the work. The motion of the waves is meant to awaken deep feelings of the memories of generations as the oceans once covered all of earth and life, and human life, emerged millions of years ago from this unique earthly environment. "Maisema meissä - Landscape In Us" - videoinstallaatioteos, jossa tarkastelemme maisemaa suuressa ja ajan hitaassa mittakaavassa, metsää, merta, joka muinon on täällä vellonut ja on vuosituhansien saatossa muokannut maisemaamme. Jossain geeniemme lokerossa jo muinaisten esi-isiemme muistot ja kokemukset (Ks. myös yhteisöteokset). Anitta Toivio ja Dotti Cichon 2011.